Yay ! I got a new home and I love it ! 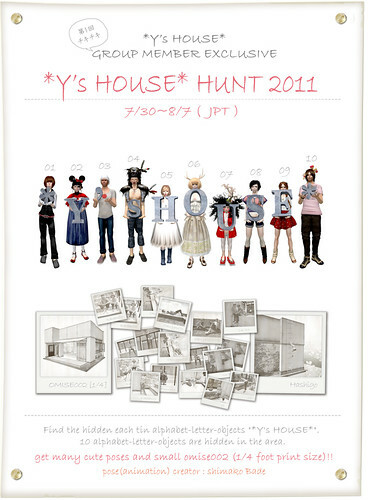 Y’s House is doing a hunt, you can get lots of poses and a House ! 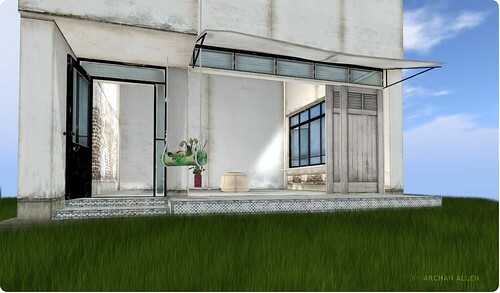 Y’s House builds are incredible, and furniture is a must have. It was quite hard to find all objects, but we did it ! (Mala Oh & me <3). We have to find *Y’s HOUSE* letters & symbols, in the main store and demo houses. The letters are quite big, but a furniture store is full of little corners, ahahah ! This look is quite unusual ! I hope you like it ! RedMint just gifted the group members a goblin skin with prim nail, and I really enjoy it ! It is a shame that this store’s elven ears are do not contain the goblin skin tone, but I got Pera‘s fabulous ears and tail, and I’m really happy ! Visit Pera ! It is so easy to customize, and so cute ! Crazy kind owner created a new dress, called Leave dress. It can be worn as a glamourous top, or as an aero dress, very natural and poetic. Visit Crazy store here ! Yummy is a new to me jewels brand, which creates amazing charms, like this fab vintage camera necklace, perfect for bloggers !! There are also designers charms ! This store is located in Tableau.